So 2.6.29 isn't quite out yet, but I've merged the new Tuz logo, so now my laptop boots up with two of these guys showing. See an earlier post about the plush version of this that I got while in Hobart for LCA 2009. Also see the Save The Tasmanian Devil site for details about the devils plight. All told, I think the kernel came out looking better than Bdale. Too cool! But this will be a one time logo, right? Only for .29? If so: Too bad! No Ubuntu with .29 .. no jaunty Tuz. Hey Linus, any chance of photoshopping a plastic snout on the image of a starving African child for 2.6.30? When did you become bono? Hmmm... Nice logo :) In my opinion it will be better if Tux and Tuz will be friends and we will see they together in every build . Tux is a fine talisman, but he will be happy if he will have friedns in screen. Nice logo! Ling Live Tuz! Idea: Make Tuz the small logo for Cell SPUs permanently. Just curious, why do you have *two* of those guys on boot? Why not just the one? I noticed this in knoppix, is this a bug or is that intentional? I'm pretty sure the number of penguins is determined by the number of cores you have. In any case, today hero is Tasmanian Devil. Doesn't an already popular unix-like operating system have a devil as their logo? Did I not once see you imply that some of those devils must be covered in fur, pleasuring themselves and (possibly) howling at the moon while focusing on security issues alone? Ok, great photo, the bathtub was a neat background.. nothing more to see here, move along, move along ... ? I don't know any popular unix-like os with similiar logo (oh, there's freebsd, but it isn't popular right?). It looks you missed sites, go to apple.$, microsoft.$ or freebsd.fans if you suffer from security issues. We have seen Moomintroll in a Zorro costume - and now THIS!!! Hi Linus, I like tasmanian devils but I have to say that the old logo is the best so far. Tux and Tuz together in the logo - the best. Single Tux or Single Tuz in the logo - bad. It is my opinion. When is Tux coming back again? Tuz is only going to stay around for a little while right? notebook96, I say it too. Frendship - it is basic relationship between items of open-source community. It can be undelined by the friendship between Tux and Tuz. I think Tuz can represent the set of recreational(non-professional) computer users who have, only recently begun convert to Linux, thanks to distros such as Ubuntu stepping up the user-friendliness. 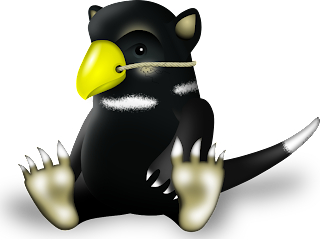 Thanks for another kernel release and raising the awareness of the plight of the Tassie Devil. The International Union for the Conservation of Nature and Natural Resources (IUCN) publishes a list of threatened species (Wikipedia) each year. - 8,283 species as being vulnerable! I find these figures extremely saddening. But if you ever need some inspiration for another temporary mascot it looks like you've got plenty to choose from! Too many people are commenting on this as if it were a bad thing. Obviously they don't know the whole story. I was there at the LCA09 Penguin Dinner, and the reason behind this temporary change in logo is because it was part of a very complicated bidding process in which we raised about $40,000AUD in one night for the Tasmanian Devil. I can't actually remember if it was just a bid from Linus, or if it was a challenge to raise more money. It all got very confusing when maths and currency exchange got involved. Why the Tasmanian Devil? Because the conference was in Tasmania, and every year at the LCA Penguin Dinner a charity auction is held to raise money for a local group. This year it was Save the Tasmanian Devil, a group working to cure the facial tumour disease that threatens to make them extinct. So please stop complaining. It's only for one release, and if you hate it for some reason, you could just remove it from your kernel. Personally, I'd prefer to keep him for longer, but I'll live with my plush Tuz. Don't want to annoy anyone... but TUX beats all! I learned all I know about linux from free books at Free Book Quest. I wish there was a group where I am that was into it, but I'm in back woods GA. I doubt it will happen. Thanks Reece for clarification. - However, Mr. Torvalds seems to have a lot of humor in his blogg. But like Sigmund Freud once said: "There is nothing more serious than a joke." can du berätta till mig att vilken distro använder du? "[quoting Diego] "You're my hero"
Not sure if Surzh is trying to correct Mr. Viola, but "You're" was the correct word choice here -- "you're" is a contraction of "you are," whereas "your" is simply the possessive form of "you." So Diego was right. "In any case, today hero is Tasmanian Devil." NOOO! Linus, PLEASE, dont't change the mascotte! Tux is cool, too cool! Is the first, is the best, is my friend! Tuz is nice, it may be a friend of Tux, but Tux must be the number One! W Tux! How do I undertake such a large project ? I am 30 years old and have been programming for 1 year in php. I want to develop my own ideas but I find that I am not that excellent programmer...any ideas how to plan and go about it ? Hmm really strange logo. I used to like previous more. Hope this one wan't be an only one during config operation. I don't like that. I think Tux is better. save the hunter of ñus!!! This is not looking good. Anyhow its your wish to use. What has been fixed with the new version actually ? hm... I was little shoked, I afraid of Tasmanian devil... it is too terrible. But, as I know, you lead movement for safe Tasmanian devil (dog?). May you have success in this very good activity. And may TUX live forever. I am writing from the College of Engineers of Peru, is to congratulate you for this work so dedicated to you to develop an operating system that serves us all .. this is the truth in order to invite him to come to Peru, which we would be happy to get in here at our institution and a joy to communicate personally to all my friends and I could do an event with their participation would depend on their availability of dates for us to schedule your arrival in Peru if you could access, and costs should not be concerned. Greetings and I hope a reply from your part dear friend ..
Les escribo desde el Colegio de Ingenieros del Perú, es para felicitarlo por ese trabajo tan dedicado que tiene usted al desarrollar un sistema operativo que nos sirve a todos .. la verdad la presente es para poder invitarle a venir a Perú, cosa que nosotros estariamos gustosos en poder tenerlo aqui en nuestra institución y personalmente una alegria poder comunicar a todos los amigos mios y mas que podriamos hacer un evento con su participación, dependeriamos de su disponibilidad de fechas para nosotros poder programar su llegada a Perú si se podria accedernos, y los gastos no deberia de preocuparle. Saludos y espero una respuesta de su parte estimado amigo ..
IM NOT SHURE IF ITS THE EXACTLY PLACE TO WRITE THIS, BUT, THIS NOTICES COMING OF EL SALVADOR, ITS A PARTY THAT EVER MAKE IN THE INSTITUTE THAT I STUDY, ITS THE NOTICE. "HELLO REGARDS FROM EL SALVADOR, GOOD THE MOTIVE OF THE MAIL IS THAT IN THE INSTITUTE WHERE I STUDY WE DO A FAIR AT THE END OF EVERY YEAR I KNOW IT CALLS " ENTREPRENEURS' FAIR ". And THIS YEAR WE WANT THAT IT IS THE BEST SINCE THE INSTITUTION EXPIRES 40 YEARS, THE EVENT LASTS 3 DAYS, AND THE THIRD DAY ALREADY TO END, AS THEY SAY THE BETTER THING BY THE END, WE WANT THAT IT IS ALONE OF LINUX AND AT ALL MORE LINUX. I think that if you threw some guns in the picture, it would make it even cooler! actual I have the logo disabled here on my desktop, but tested it about a week ago. Looks different. Thanks for the clarification Reece. I was about to post my unhappiness about this "new" logo. LONG LIVE TUX! You should permanently change it. After all my work I did, some devil?! Pinguin stays! Nu förstår jag varför min fyrkärniga blackeditonAMD spökar så med fyra jävlar i burken. This one should please anyone. I think you must change this logo. It doesn't look that good. The logo is looking awesome. It is fine than the previous one. I hope this will definitely attract the people. I love to see the Tasmanian Devil in a full view. It is more attractive. It is very nice to see it. Thanks for sharing this great experience with everyone. I don’t know If I said it already, but this so good stuff keep up the good work. I read a lot of blogs on a daily basis and for the most part Kenali dan Kunjungi Objek Wisata di Pandeglang just wanted to make a quick comment to say I’m glad I found your blog. Thanks. I like your blog and the way you think and talk. Really a nice work! God bless you! Welocome to our sites www.shoxsport.com and www.ed-hardy-clothing.us. There you must can find what you want! shox shoes is made for runners. nike sports shoes includ nike tn dollar “cheap nike shox” JORDAN WOMEN SHOES and ferrari shoes. They are all original and in a perfect condition. By the way ,the nike running shoes is really good Nike Air Max Tn ,don’t forget buy the nike shox r4 and nike air max ltd by the internet when you need them . Do you know Nike Air Shoes nike air max 360. nike shox nz which are the ideal and perfect choice to the people like running and basketball. Wholesale and retail are both acceptable to us. Welcome to our site and free to look! God Bless You! Good Luck! If you like to pursue fashion and like to show out your individualites to the crowd, then you must have a piece of ed hardy clothes, ed-hardy boots for women , ed hardy shirts, ed hardy mens , ed hardy swimwear, Ed Hardy Jeans, Ed Hardy Hoodies. The fashional outlook and the good quality of the Ed Hardy Sunglasses,Ed Hardy Shoes, ed hardy dresses, ed hardy love kills slowly , ed hardy womens t shirts, ed hardy t shirts sale brought a big success to them and made big hit on the market. Wholesale and retail are both acceptable to us. Welcome to our site and free to look! Thank you and wish you a nice day. Good Luck!